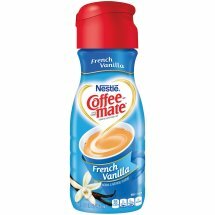 Nestle Coffeemate is coffee's perfect mate.Non-Dairy, Lactose-Free Coffee CreamerGreat-tasting French Vanilla flavorGluten Free, Cholesterol FreeTransforms your coffee into creamy deliciousness. Water, Sugar, Vegetable Oil (High Oleic Soybean and/or Partially Hydrogenated Soybean and/or Partially Hydrogenated Cottonseed), and Less than 2% of Sodium Caseinate (a Milk Derivative)**, Mono- and Diglycerides, Dipotassium Phosphate, Natural & Artificial Flavors, Cellulose Gel, Cellulose Gum, Carrageenan. **Not a Source of Lactose.